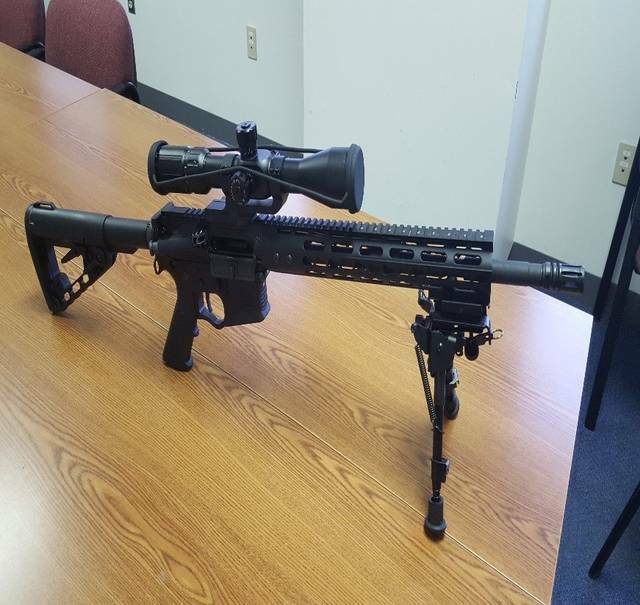 LIMA — Allen County Sheriff’s Detective Ryan Ream said the weapon confiscated from Tristan Ascura had been altered with an aftermarket scope rated for 1,400 yards, an aftermarket bi-pod, a rail system and a collapsible stock. Ascura, 19, of Lima was taken into custody Thursday after being reported for allegedly making verbal threats of violence toward Elida High School. When deputies arrived to arrest Ascura they discovered an AR-15 altered with over the counter modifications and many rounds of ammunition. John Kleman, a gunsmith at Ottawa Ordnance Firearms and Accessories, said such modifications are all over the counter and easy to install without any advanced mechanical knowledge. The firearm doesn’t require any special permits to own or purchase. As long as a buyer is at least 18 years of age or older and can pass a background check, they can purchase an AR-15, he said. The rifle is not an assault weapon. In order to be classified as an assault weapon it has to be a fully automatic firearm, said Lt. Andre McConnahea, public information officer with the Allen County Sheriff’s Office. McConnahea said many people believe the “AR’ in AR-15 stands for automatic rifle but it actually stands for Armalite Rifle, which is the company that originally designed the firearm. The rifle can be purchased in the base model for around $400 to $500, said Kleman. Without special modification the AR-15, fires as many rounds a minute as the shooter using it pulls the trigger. For the average gun user the range is about 100 yards, he said. With special modifications, which takes special licensing to be done legally, the rifle can be modified for automatic fire and will fire 700 to 800 rounds per minutes, depending on how good the user is at reloading clips. McConnahea said selling an assault weapon, a fully automatic firearm, is a very serious federal crime. This entry was tagged ascura. Bookmark the permalink.